Crusty Sean (Japanese: ロブ Rob) is a character in Splatoon and Splatoon 2. He is a Japanese tiger prawn who runs the shoe store Shrimp Kicks in the first game and the food truck Crust Bucket in the second. Crusty Sean is a humanoid shrimp wearing a dark purple beanie and a fuzzy yellow-orange jacket, giving him a resemblance to tempura. He has two arms that end in pincers and four pairs of legs, each with a different pair of shoes. From highest to lowest, these are: pink and red Arrows, Blue Sea Slugs, Pink Trainers, and purple and white Hi-Horses. Crusty Sean's appearance remains largely the same in Splatoon 2. However, instead of a beanie, he wears a white baseball cap turned backwards, with Enperry's name in Inkling visible from the back. He also wears black-rimmed glasses and a black hoop earring on his right side, despite not having visible ears. From highest to lowest, his shoes are: White Norimaki 750s, Yellow-Mesh Sneakers with blue instead of magenta, Arrow Pull-Ons, and Sun & Shade Squidkid IV with some color alterations. Crusty Sean is the shopkeeper of Shrimp Kicks, the shoe store in Inkopolis Plaza, and is known to be carelessly friendly. He is obsessed with wearing many of his favorite shoes all at the same time thanks to having many legs. While his "fried" body gives him the look of a tempura, it is actually just a slightly morbid designer jacket. Crusty Sean's version of DJ Lee Fish's song Lookin' Fresh has the bass turned all the way up and emphasizes percussion, because his gear corresponds to the lower part of the body. Furthermore, the heavy beat gives it a bouncy sound, reflecting his outgoing personality. In Splatoon 2, Crusty Sean is no longer the owner of Shrimp Kicks and now runs a food truck, the Crust Bucket, in Inkopolis Square. He now sells various foods and drinks which offer various benefits to players. His food items can increase the amount of coins earned or level points gained during online play by 1.5×, 2×, or 3×. His selection of drinks increase the odds of rolling certain gear abilities, as well as giving a boost to gear experience gained. The only way to buy from the Crust Bucket is by using tickets that can be found in Octo Canyon or earned from Salmon Run bonuses. ""Yo squiddo! Good to see you here in Shrimp Kicks! "...Is what I WOULD be saying if you weren't so UN-FRESH. For reals dude, do you even battle? You gotta have that Level 4 freshness before I can help you. Sorry, them's the rules! You know how to up your level, right? Just go to the lobby and do some regular battles! You got this!" - When a player below Level 4 enters the shop. "What's good, squiddo? Glad to see you here in Shrimp Kicks! You're looking pretty slick there! Somebody's been battling, am I right? Just so you know, all the stuff I'm selling comes with abilities attaches, no extra charge! If you don't know about abilities, just press and check out the manual. Ya heard?" - When a player at Level 4 or higher enters the shop for the first time. "Yo, I swear you're fresher every time I see you. Itchin' for some new kicks? Take a look!" - When the player enters the shop upon reaching Level 5. "Whoa there, squiddo. You are waaaaay too offline right now. Talk to me after you get your internet on." - When the player is offline. "What up, squiddo?!" - When the player enters the shop. "You gonna buy it?" - When the player selects a pair of shoes. "You equipping it?" - When the player purchases a pair of shoes. "Nice doin' business with ya! Tap Equip on to switch your gear, aight?" - After the player chooses whether to equip a new pair of shoes. "Don't trip, squiddo! You already got those kicks!" - When the player tries to purchase shoes they already own. "You're a little short on cash, squiddo." - When the player does not have enough Cash. "What up, squiddo? Nice seeing you here in Shrimp Kicks! OK, like... WOW. Just, wow. You took this fresh stuff to a whole 'nother level. I just... can't even." - When a player at Level 20 or higher enters the shop for the first time. (Welcome to Shrimp Kicks! ……Well, what? You're still not fresh! Come again after you get more oomph, oomph! If you come again after you get upon level 4, you'd be little fresh, huh? What you'll do about getting your level up is, entering the lobby and the Turf War! You'll soon get up as you battle a bit.) - When a player below Level 4 enters the shop. (Welcome to Shrimp Kicks! Oh! You're pretty fresh, huh? Well, my shoes'll be givin' you even more oomph than you already got! They've all got abilities to put you at the top of your game during battle. Just press and hit that 「？」, it'll tell you all about 'em. Peace!) - When a player at Level 4 or higher enters the store for the first time. (You feelin' that?) - When the player selects a piece of clothing. (Wanna equip it?) - When the player purchases a piece of clothing. (Yo thanks! If you wanna change up your gear, press that sweet little "customize" on !) - After the player chooses whether to equip a new piece of clothing. (You don't got enough money!) - When the player does not have enough Cash. When the player talks to Crusty Sean for the first time. "Alles blits, gup? Welkom bij Pelles Octobus! Geniet hier van een hapje of drankje om extra ervaring en geld te verdienen tijdens gevechten! Het enige wat ik daarvoor van jou wil, zijn coupons. Dus, wat mag het zijn?" When the player talks to Crusty Sean. When the player selects a snack or drink without the right ticket. "Zonder coupon geen bediening! Sorry, maar ik maak de regels niet. Nou ja, eigenlijk wel, maar ik moet echt eerst een coupon zien." When the player leaves or has selected a snack or drink to buy. 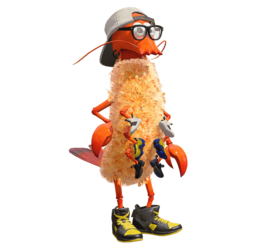 Crusty Sean's name is a play on the word "crustacean". Despite what it may look like, Sean's crusty coating is only a jacket. He has not actually been fried and made into a tempura dish. However, according to the developer's interview, Live from the Squid Research Lab's report states that he actually deep-fries himself in a batter bath to achieve this appearance. He needs to repeat this bath every day to keep the batter crispy. According to the art book, his hobbies include collecting movies and he is looking for "a cute girlfriend". Crusty Sean is the only shopkeeper in Booyah Base who is taller than the average Inkling. Sheldon, Jelonzo, and Annie are all shorter than the player. Sunken Scroll 21 contains an image of fried tempura prawns with remarks referencing Sean. Crusty Sean was first revealed to be returning in the first full Splatoon 2 trailer, and was confirmed to be Crusty Sean and not another prawn character in an interview with Hisashi Nogami for Famitsu magazine. Crusty Sean (or a shrimp that looks like him) can be seen in the crowd of Pearl's gig in the photo in Marina's chat room. Official art of Crusty Sean. Crusty Sean in his shop, Shrimp Kicks. Crusty Sean waving at the player with two of his ten limbs. Crusty Sean's reaction to the player not having enough Cash. Concept art of Crusty Sean. Crusty Sean's icon on . Crusty Sean's food truck, the Crust Bucket, in Splatoon 2. Crusty Sean taking the player's order. Crusty Sean's lowest pair of shoes can be seen in-game through the door in the back of the truck. ↑ Hisashi Nogami Famitsu Interview Nintendo Everything translation. This page has been accessed 71,737 times.